CalAgJobs and the California FFA have teamed up for a second year in a row to create a t-shirt that promotes the importance of agriculture and FFA to California. The shirt showcases a California grizzly bear with the phrase “California Gold” with the California FFA logo. The t-shirts will be gifted to those who donate $15 or more at the California FFA, CalAgJobs booth, or online during the 2018 World Ag Expo. All proceeds from the t-shirt sale will be donated to California FFA Foundation. “The California FFA Foundation is excited to be partnering with CalAgJobs again this year and connecting our members to resources that will support keeping them employed and engaged in the agriculture industry in California,” added California FFA Foundation Chair, Dennis Albiani. The shirt is being offered in youth sizes XS-XL and adult sizes S – 3XL in both men’s and ladies styles. 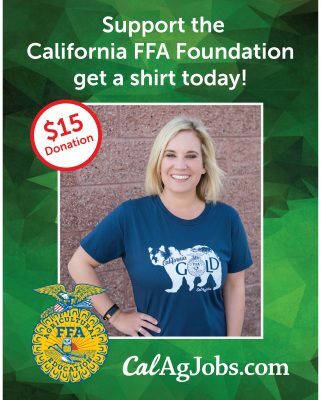 Miranda Driver, the Marketing and Communications Director for CalAgJobs, has been working dedicatedly in the past months to develop the idea, create the design for the t-shirt, and poll FFA students on their favorite design. “These t-shirts are a great way to advocate for California agriculture and give back to an amazing organization that promotes and inspires the next generation of agriculturalists,” said Shannon Douglass, the Director of Outreach at CalAgJobs. The World Ag Expo will be running from February 13th through 15th at the International Agri-Center in Tulare, CA. The California FFA will be located in booth 7102 in the Ag Careers & Education / World Ag Women Pavilion. CalAgJobs will be located in booth 1418. T-shirts can be obtained online at http://www.customink.com/fundraising/californiagold. « Your Resume: Pack it Right!